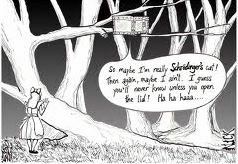 I bet you more people have heard of Schrodinger’s cat than the Law of the Excluded Middle. I say that because people like paradoxes if they show how ‘fab and groovy, windswept and interesting’ they are, but how many people ask enough questions to resolve the paradox? That’s usually the job of scientists, but with quantum physics and Heisenberg’s Uncertainty Principle those questions remain unanswered. In fact, it’s worse than that. In order to explain certain quantum phenomena, scientists have had to resort to suspending the laws of logic. How can Schrodinger’s cat be both dead and alive? Paul Boateng once asked the same question about the Labour party at an Oxford Union debate on ‘zombie politics’. The answer was that it depended whom you asked. The Lib Dems wanted Labour to be dead, but the Conservatives relied on the party being very much alive! It’s the same in the world of astrophysics and quantum mechanics. If you believe Einstein’s General Theory of Relativity, you get one set of answers, but if you believe his Special Theory of Relativity you get another. The world of the very large and the world of the very small appear to behave according to different sets of rules. Admittedly, those rules make scientific experiments predictable to an astonishing level of accuracy, but they’re still different rules. Is it too much to ask that we have only one set of laws however big the objects we’re trying to describe? Whether it’s photons or subatomic particles, physicists usually get away with breaking the rules of logic by invoking probability theory. Now, probability theory is just a decision-making tool and not any kind of explanation of cause and effect. The only reason we calculate probabilities is that we don’t possess complete information. If we toss a coin, we say the chances of it being heads or tails are one in two or 50%, but that’s just because we haven’t tossed it yet. Once we’ve tossed the coin, and it turns out to be tails, say, the ‘probability’ of that outcome collapses to 100%. If it’s tails, there was actually never a chance that it was going to be heads. It’s just we didn’t know all the variables such as how high the coin would be thrown or how fast it would be spun. With perfect information, probabilities are meaningless. However, quantum physics begs to differ. Whether it’s the rate of radioactive decay or the presence of electrons at different energy levels, outcomes are given probabilities as if that predicts and explains the phenomenon. Making predictions is fundamental to the scientific method, so we surely deserve a better answer than, “Well, it might do this or it might do that…” Logic demands that there is no effect without a cause and that causality runs from the past to the future. How have we reached such a pass that both those ideas have been thrown out the window? People used to ask whether knowledge of the positions and masses of every particle in the universe would theoretically make possible accurate predictions of every single event in the future. The uncertainty principle seemed to put an end to such speculation, but not in my book. If probability doesn’t actually ‘explain’ anything, then you’re back to looking for good, old-fashioned cause and effect. Unfortunately, that throws into doubt a whole lot of notions we tend to take for granted. Take free will. How can I be said to make a ‘choice’ when it’s simply the result of a collision between subatomic particles…? Do we all have to be biological determinists now? This entry was posted in Philosophy, Science and tagged logic, philosophy, quantum physics, Schrodinger's cat on October 2, 2011 by Nick Dale.